The Dolan Center for Science and Technology is John Carroll University’s showcase building. Completed in 2003 at a cost of over $66 million, the Dolan Science Center houses JCU’s science departments, including Mathematics and Computer Science. With 265,000 square feet of floor space, the Dolan Science Center includes not only classrooms and labs, but also ample, airy, and open spaces for students to study or work together on class projects. 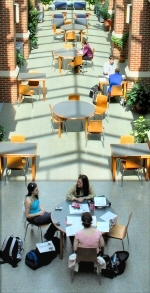 The attractive light courts, which are located adjacent to classrooms and faculty offices, are popular spots for students between classes. The two open-air balconies are great places to work or take a break from studies while catching a few rays, and the expansive atrium provides additional study space. Wired and wireless Internet connections are available throughout the Dolan Science Center. In addition, computer labs provide access to laser printing and specialized software. 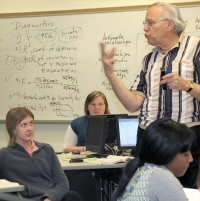 The mathematics and computer science department provides a free walk-in tutoring service for JCU students taking courses like calculus, statistics, and introductory computer science. In the Tutoring Room, you can get one-on-one help with your classes at just about any time of day. Of course, you are never far from your professors, who are here to help you succeed. If you would like to learn more about studying Mathematics or Computer Science at John Carroll, we would love to hear from you! Prospective graduate students can learn about our master’s degree programs by exploring our website. Prospective undergraduate students can learn more about our bachelor’s degree programs in mathematics, computer science, and computer information systems from our website, and can explore JCU, in general, through the Office of Admission website.